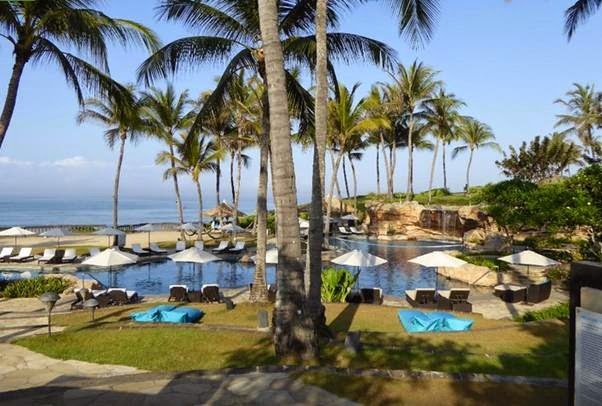 If you hobby of playing golf and want to play on the edge of a cliff with a backdrop of sea and Balinese temple, Pan Pacific Nirwana Bali Resort is the right choice for your to stay. Lot of activities can be done in this hotel. Very romantic place for couple and you can take a short walk to pura tanah lot. Convenience place to stay with great atmosphere. 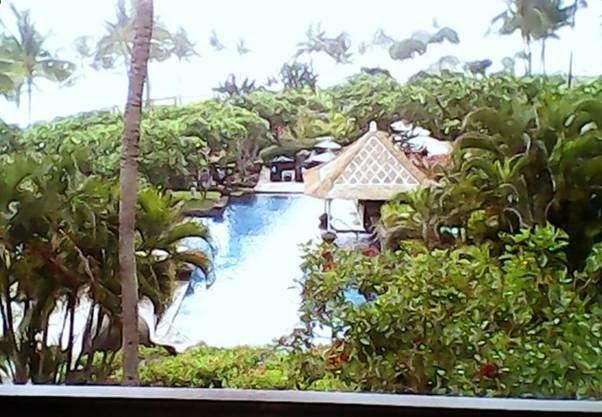 The scenery is beautiful, you can stare into beach and swimming pool from the room balcony. There are also golf field around the hotel that add more value for the scenery. The hotel is located in a very calm and quiet. So it is suitable for solitary place, away from the hustle of the city. However, to achieve this hotel is very easy. When viewed from the available infrastructure, this hotel is great. Entrance incredibly broad, golf course, overlooking the courtyard mainland coast amazingly spacious, large swimming pool equipped with a slide for children, well done. Pan Pacific Nirwana has a very large swimming pool with a view directly to the mainland coast, very beautiful at sunset, as Tanah Lot is very famous for its sunset views. for the room was also quite spacious with a large size tv and balcony to see a view towards the coast directly. breakfast provided enough variety plus the location of the restaurant close to the beach so it is lovely to have a view of the beach at breakfast. 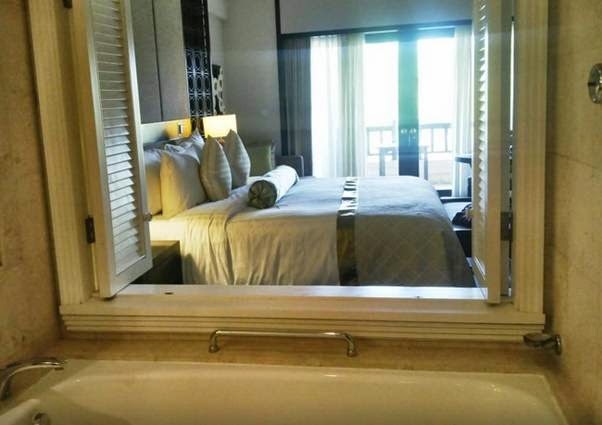 in general the hotel pan pacific paradise close to the land lot and view the beautiful beach. Because it is located far away from the crowds, then you will be hard to get stores and supermarkets around the hotel. One thing that most felt when entering into the area of the hotel is an old building, need direnofasi. But in general, the whole building is well maintained. Where expectations are that spans a wide white sand beach and want to swim at the beach, the resort is not the right choice. 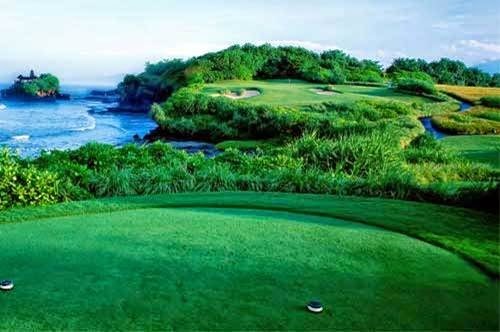 From the golf course you can see the Tanah Lot temple is very beautiful. While playing golf you will feel the wind sea and fresh air by the sea. Shades of green with the sound of the ocean waves can give you a feeling of comfort and soothe. You can see the sunset from the golf course at the resort. 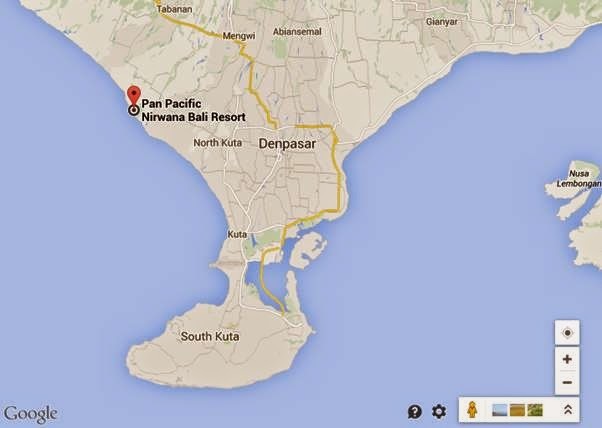 Pan Pacific Nirwana Bali Resort is a great place as a location to conduct the wedding. Wedding ceremony ever performed on a golf course of this resort. With the view that and beautiful background, can provide wedding atmosphere becomes more memorable.